“The gluten free wrap is made with no gluten ingredients (the wrap itself is gluten free), but we can’t call it gluten-free because of the risk of cross contamination. As it is made on site every day, and not in a segregated room in a factory, we can’t guarantee ‹20ppm. (this would mean putting the product on hold, send it out to a lab for testing and then release it once the results were available. We don’t carry sandwiches over, so wouldn’t be able to retain stock for analysis and wait for the results. Interestingly the product name on the website is “Mexican Guacamole Wrap” and makes no mention of gluten free. However it then states underneath “does not contain gluten”, with then further small print saying they cannot guarantee completely free from any allergen. 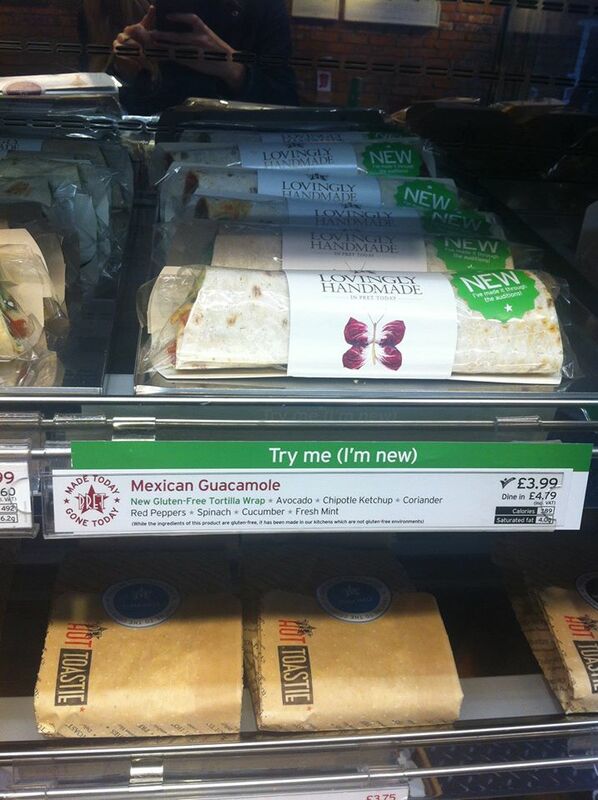 The product is described in store as a “New gluten-free tortilla wrap”. Clear enough? Personally my initial reaction is to avoid this one, as the cross contamination controls just sounds like basic hygiene rather than anything to avoid gluten cross contamination. Odd one- they surely aren’t technically correct as the likes of Dominoes etc can call their product ‘gluten free’ without testing every batch, based on the controls they use. Perhaps they should be looking for Coeliac UK accreditation for their process and training. Also, are we guilty of holding Pret to a standard we wouldn’t hold other restaurants e.g. independents to if they also served GF bread? Carly’s first point is of course correct, if Pret had engaged with Coeliac UK to gain official accreditation they could have indeed labelled their wraps gluten free. To do this they would have to demonstrate that clear and documented cross contamination controls were in place along with staff training. I had mentioned in my emails to Pret that I was surprised that a company of their size had not worked with Coeliac UK when rolling out a gluten free option, unfortunately they did not reply to this point. Moving on to Carly’s second point and that’s a really interesting one. Rightly or wrongly I do expect more of a large chain. They have the resources to ensure they have responsible allergen processes in place, and if they don’t have confidence to put procedures in place on-site could have brought in a wrap prepared off-site. One of the main differences to me between a chain and an independent is the point of contact. If I email an independent restaurant I generally get emailed back by the manager, chef or owner detailing exactly what they do (or don’t!) do to prevent cross contamination. If I’ve contacted the customer services team of a large chain I expect some sort of standard reply. Pret initially didn’t seem to know what I was talking about, and took a week to come back with essentially “we wash hands, counter and put stuff back in the fridge”. No mention of separate utensils and nothing to inspire confidence, and as a coeliac confidence is what I need to enjoy food when eating out. It is of course welcome to see more and more companies offering a gluten free option, but this one just makes me a little uneasy. Am I being too harsh? I am genuinely keen for your feedback on this one, and I’d really love you to comment below with your opinions or if you’ve tried the wrap. Coeliac UK have also said they are going to look into this one so I will be interested in their response too. I’ll be sticking to the Costa gluten free wrap for now, which is certified gluten free. I hope I’m wrong about the Pret offering but it just goes to show that it’s the confidence gained from the first point of contact that dictates if we eat somewhere as a coeliac. Thanks also to Sarah from the Wuthering Bites blog for the photo. UPDATE 08/08/14: Following comments on this blog I asked Pret to clarify if other items such as salads and soups were subject to the same cross contamination risks as the wrap. Their reply below. I would like to explain that everything made in our kitchen does not contain gluten ingredients ie salads. Items which do not go into the kitchen such as soups, popcorn bars are definitely gluten free and not at risk of cross contamination. So we only say gluten free on the items which are not at risk. I have confirmed with our food team that there is indeed a slight risk of cross contamination for our salads. We’re discussing kitchen processes with Pret who are very anxious to avoid confusion and want to provide suitable options for customers. I am sorry you are concerned about the labelling of our chicken harissa wrap. We are very keen to ensure our labelling is informative and allows our customers to choose their food with confidence. With regard to the labelling of food made with gluten free ingredients, we are at present in contact with Ceoliacs UK so we can gain from their years of experience. These discussions are still ongoing but we will be more than happy to contact you once they have reached an outcome should you wish. Just to reiterate a little of what we have said already, we are unable to label our freshly made food as gluten free as they are all made in the same kitchen throughout the day and we cannot fully guarantee there will not be any cross contamination. However we did want to let our customers know we were making the chicken harissa wrap with a gluten free wrap and so highlighted this on this particular label. We will indeed let you know of any outcome with our conversations with Coeliac Uk. With regard to your comment about customers not being able to get information about certain allergens in our food, this detailed information is available on our website and our app, and our shops have access to this information as well. As our fresh food is made on the premises, the law on labelling is a little different and we are not obliged to list every allergen for these products. We have of course made the changes to the labelling on all our products that are not made in the shop such as cakes and drinks. As Laureanne mentioned when you contacted us originally last summer, we do have robust cleaning procedures and checks in place to prevent cross contamination between products. These include the thorough cleaning of benches and equipment, Kitchen Manager line checks, and clear storage guidelines. I still don’t think they really “get it”. Catering gluten free is far more than just cleaning down and good hygiene practise, and I can only hope that the discussions with Coeliac UK bring a positive resolution. I will of course bring you an update if they get back to me in the future as promised, but I feel I’ve taken this as far as I can at the moment given the answers I am getting. There continue to be many concerns on Twitter with Pret’s handling of allergens, and this is covered in Alex Gazolla’s excellent post covering the Pret allergen situation which is well worth a read. I would of course as always love to hear your comments if you have experienced dining gluten free or with another allergy in Pret, be them good or bad. Thanks for posting this. V. excited to try it out. I’m gluten-intolerant but can handle cross-contamination to a small degree. Lunchtimes are always hard for me as I don’t make my your own food in advance. So nice to know I can now head to Pret, for a lunchtime snack. Interesting post thank you! I’ve always been surprised at Pret being so slow on the uptake with gluten free given they do seem to have quite a few options if you look at the allergens folder, plus the ethos of fresh, simple food. They obviously lack confidence on this one – a few more requests for coeliac Uk accreditation might give them a push. I’m always torn because I make and store food in a gluteny kitchen and just employ common sense – but it’s hard to be sure that in a busy kitchen common sense will always be followed! Such a half-arsed effort to provide something they think people want. Essentially, they’ve catered this towards the ‘gluten-avoiders’ and dieters rather than taking into consideration someone who has a medically diagnosed condition and has to eat gluten free to remain healthy. I agree with you regarding Carly’s point, whilst we’re more lenient on independent caterers, generally when I arrive in a restaurant I can speak to someone and discuss the cross-contamination controls to make it clear to them. I can’t do that in Pret when the sandwiches have been made up earlier in the day. If large chains like Domino’s, Pizza Hut, Pizza Express, Zizzi, Ask, GBK, Giraffe, La Tasca and Prezzo can provide dishes that are safe, where there are strict kitchen processes and training then I don’t understand why Pret can’t. It’s not difficult to have separately coloured/labelled boards and utensils and to set aside one part of a kitchen. Their response is embarrassing and to say they have to send it off is stupid. Do it properly or don’t do it at all!! I too am genuinely surprised by Pret’s lack of gluten free awareness and how they’ve made little effort to jump on the gluten free band wagon as other companies currently seem to be doing with their to-go products. I used to really enjoy their food prior to being gluten free but I’m always disappointed with their lack of labelling on products. If they stated specifically that they used separate boards, and a separate area, with everything being wiped down and employees using clean gloves, I think I’d feel a little more comfortable consuming the wrap. If you didn’t feel comfortable eating it, personally I’m a little conflicted, I think it’d be interesting for Abby to do a review (as it seem it’s veggie (hurray!)) just to see how it compares to similar products. It sounds as though they are jumping on the bandwagon in order to make money, not life easier for us! They have seen the words ‘gluten free’, have seen that Costa and Starbucks are making a lot of money at it and have just thrown together a gf wrap, a few non gluten containing ingredients and stuck a ‘gluten free’ label on it. Guess what, Pret, it isn’t going to work. Coeliacs need more reassurance than a label – or are you OK with being sued because your products are not actually gluten free? I personally think they are being very responsible. They are technically correct in that they cannot call it gluten-free unless they have tested it to be less than 20ppm. All they therefore can do is say it is NGCI…which means there are controls in place to prevent cross contamination but that they cannot say it contains less than 20ppm. All restaurants and cafes should be doing the same,…instead many say things are gluten free when they are not strictly so (according to legislation). I am not sure I would feed my child one of these but if I was the coeliac then I would be able to make an informed choice. What is the difference between them and all the other chain coffee shops who say they are providing a gluten free sandwich? Are they really gluten-free if you question them? I don’t know cos I haven’t had time to ask! I once loved Pret think it was all about the gluten free orange cake ( never bettered) now I avoid! Other food establishments can guarantee gluten free food – it won’t be bought by me -if Pret want to tap this market properly they will have a re-think. My view is that they should just describe it as NGCI and make that cross-contamination risk assessment known to the consumer both in-store and online. My objection comes with their online use of the “does not contain gluten” term, which should never be used. When will food businesses begin to take on board that gluten-free foods contain gluten? Be it 3ppm or 8ppm or whatever they happen to be tested at – they (probably) usually do. The law essentially redefined ‘gluten free’ to mean under 20ppm, but because it did no such thing with ‘does not contain gluten’ – that phrase should be taken as read. Nobody – nobody – can rightly claim something does not contain gluten because we cannot test 0ppm and therefore cannot prove it to be so! So there are two options: gluten free or not gluten free. If you know which, say so if it’s the former and say nothing (or ‘contains gluten’) if it’s the latter. If you don’t know which, and you can claim NGCI, then say so. But don’t mention gluten in any other context. It is just confusing! Thanks for taking the time to comment Alex, the lack of clarity and the potential for confusion is what is really frustrating me on this one. As you say NGCI is the way to go, unless they want to go through the Coeliac UK certification process, but I’d still want to see more clarity in their procedures before they achieve this. To me NGCI indicates an understanding of the law and cross contamination issues, I’m not convinced Pret have an understanding of either at the moment! To be honest, surprised Warburtons have not done more to work with them on this, as it’s their product being used. To be clear (if Pret are keeping up with this debate!) the last thing we want is the product withdrawn because it’s too hard & causing too much fuss. We would simply ask for *at least* clarity (and legally correct wording!) on the label and ideally proper training/procedures in place for gluten/other allergen free menu options to minimise contamination. They need to get story straight across the range. Seems like a classic example of the marketing team being responsible for the website/labelling etc. with no responsibility for food production controls. Very well said Carly. It is the lack of clarity that to me is the real issue here. Let me see if I can get an answer from them on the salads etc. Thank you for your blog entry. I was particularly interested when I saw this entry as I had a Pret salad the other day. I was bought it by a client, it was a chicken salad. There were no I ingredients on the box & the chicken had some sauce on it so I left the entire Hal of the salad which the chicken was on & just ate some lettuce leaves, red pepper, cucumber & some cheese. I then had an upset tummy. I think I was presented with a similar salad a year ago & had eaten the chicken & was very poorly. I thought their cross-contamination controls can’t be surely that poor to contaminate a salad!! (Even though I am a very severe Coeliac.) If you need further ammunition with Pret please share my story. Last time I ate something somewhere else advertised as gf which clearly wasn’t, I ended up in hospital. If they’re not going to make the effort they shouldn’t advertise their products as gf (I’m sure I saw something in store advertised as gf the other day.) I don’t think some caterers even consider it. I also went to a sandwich shop the other day & ordered a cheese salad & she knew I was gf. She promptly cut the salad on the same board she had made a sandwich on. She then used her hands to get some lettuce!! This I also saw at Subway. We shouldn’t have to ask them to use utensils, it should be H&S. Needless to say they went in the bin & I was too stunned to say anything. As it stands, I can’t even buy a salad without it all being contaminated! Look forward to hearing any more response from Pret. Thanks for the comment Emma, Pret are aware of this blog post so hopefully monitoring the comments! I have read with interest your blog. Just over a week ago I was bought a gf harrisa chicken wrap from pret. Within 2 hours after eating it, I was unwell and violently sick. There really was nothing else i could attribute the sickness too.My husband contacted pret to see how this may have happened. Customer services at pret said they sold 20 gf wraps that same day without any problems.Fortunately we still had some wrap left in the wrapper and returned some to pret for testing. We also did our own test for gluten,which showed a positive for gluten.Pret contacted us today to say that on their test it was negative for gluten?? We have requested a paper copy of the ingredients to rule out anything in the filling which could contain gluten,though we are yet to receive this. Just wanted to alert other coeliacs to be cautious when considering buying these wraps. I am so happy to have found this post! I usually go Pret and today i decided to do some resrearch as i wasnt feel to secure about thier products. I also found this pretty amazing article. It refers to Pret and other brands inc toothpaste. I could not believe how accurately it told the story of coeliac patient. It also has some legal analysis in – advising what options there are for someone who has been told a product is gluten free but then has had an adverse reaction. I found it interesting that america consider this as a disabiltiy and coeliac patients have the same protection avaiable as a disabled person. Also Australia has some tough labelling laws. Im amazed. Please do read and share. I have to commend the author!! Article: In search of news laws for a gluten kingdom and i believe the author is Mohammed Saleem Tariq. I had to use google chome – AMAZING MAN!